Although I have returned to the U.S., I am still committed to writing insightful content about my experience living in Mexico. A few months ago I blogged about Mexican food – breaking down that country’s diverse culinary options in several categories – tacos, tamales, etc. You can read about it here. Part Two – today’s entry – picks up where the first one left off. Fine dining takes many forms in Mexico. Muy comun in Mexico City – and particularly for lunch – are fondas – restaurants with “Menu of the Day” offerings at affordable fixed prices. The quality varies but the order is almost always the same: your choice of soup or consommé, then your choice of rice or pasta, then a main dish (typically three to choose from, accompanied by frijoles and a small salad), then a postre (dessert), often Jell-O. Bread or tortillas are usually served, and the beverage is “flavored water” such as flor de Jamaica (hibiscus flower). If you are willing to pay extra you can get soda or beer, but the agua de fruta is delicious and the whole meal will seldom set you back more than 70 pesos (about $5 USD). Usually the price is closer to 50 pesos ($3.50 USD). Interestingly enough, the main dish is usually the least appetizing of the entire meal’s offerings. In my previous post on this subject, I mentioned a few of the types of street food. However, I didn’t provide much insight into how they are served. 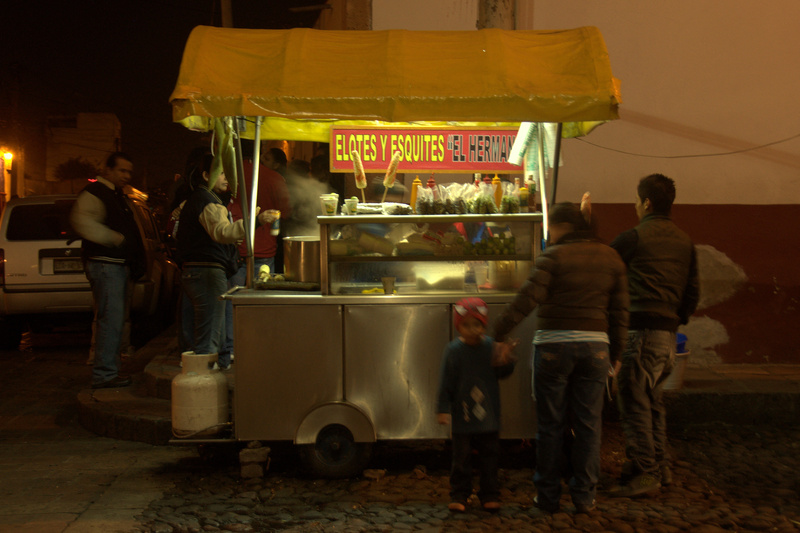 Puestos are semi-permanent kiosks serving food in a market or open-air environment. Some are stationary while others are taken down every night. Seating is usually in the form of a few (never more than six) plastic chairs, the diner’s back facing the sidewalk and the cook’s back facing the street. A canvas tarp flowing down the back of the puesto offers protection from dust and dirt. You can find virtually any kind of food on offer, but the most common are tacos and tortas (sandwiches served on French bread). Puestos that are of a more mobile variety usually offer just one or two items, for example elotes (corn on the cob, served with mayonnaise, cheese, and chili powder) or esquites (the same but without the cob). See below photo for an excellent example. One thing that, somewhat surprisingly, sets Mexico apart from the U.S. is the proliferation of coffee shops. They are everywhere. The U.S. has Starbucks, but so does Mexico (prices are comparable, perhaps even higher at Mexico Starbucks franchises). 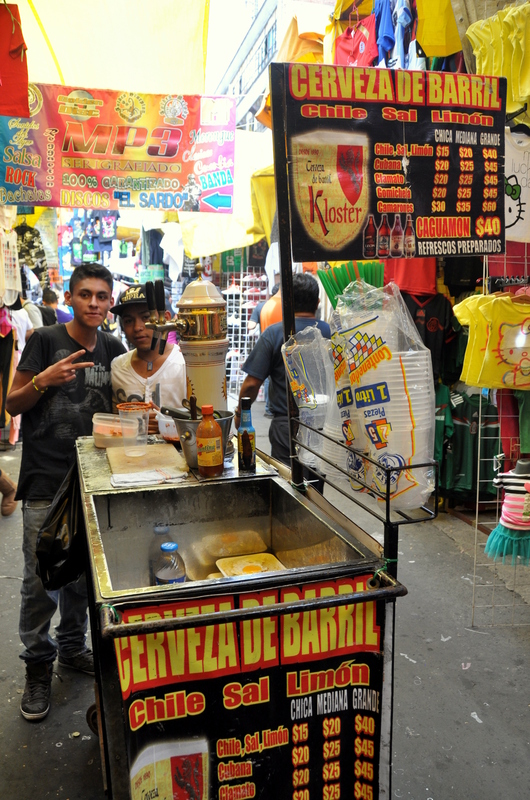 The U.S. has Krispy Kreme, but so does Mexico. Mexico has numerous other gourmet coffee shops as well. Some, like El Cielito Querido, hope to capture those disenchanted Starbucks consumers; these franchises even go far enough to point out that their coffee sizes are small, medium, and large. Others – independents mostly – occupy corner stores in residential neighborhoods, have their own décor, and sell exclusively Mexican-grown coffee (which is very good, btw). A favorite is locally-owned Café El Jarocho, which operates several branches, all in Mexico City’s Coyoacán Delegación. I could write more about Mexico’s remarkable coffee culture, but I’ll end this section by sharing a photo taken from the terrace of what is perhaps Mexico City’s most well-located coffee shop: Café de la Gran Ciudad. Can you imagine sipping a warm beverage with such a view across from your table? This picture definitely speaks a thousand words. The U.S. tipping culture has slowly made its way around the world, albeit in lower percentage amounts. Mexico is no exception. Tipping is expected at fondas and sit-down restaurants, and is appreciated at the higher-end puesto as well. 10% is the norm, even for exceptional service. That being said, if you pay cash and need change, be sure to specify. I once laid down 200 pesos for a 130 peso bill and my server didn’t return any change until I chased her down. She felt guilty – and I felt guilty that she felt guilty – but it was a simple misunderstanding that saying “cambio, por favor” (“change, please”) could have prevented. A more pleasant custom is that of wishing your fellow diners a good meal. “Buen provecho,” or “provecho” for short, is the Latin American equivalent of “bon appétit.” A good waiter will wish that you “enjoy your meal” in the U.S., Europe, and elsewhere, but it is only in Latin America that you’ll get that same greeting from other customers at the restaurant, usually as they are leaving. My first experience with this was the tiny town of Panajachel, Guatemala, in 2005. A husband and wife wished me “buen provecho” as they settled their bill and I did a double-take, looking around to be sure they were really talking to me. My biggest culture shocks upon moving to Mexico was figuring out restaurant hours. Lunch seldom starts before 1 p.m., and most restaurants and fondas don’t even open until 12:30 at the earliest. Even McDonald’s – to name just one fast food chain – doesn’t start serving lunch until noon. I mention this as a “shock” because my class schedule turned me into an early bird. I was accustomed to most U.S. – and European – restaurants opening for lunch at 11 a.m. – but here I had to either wait until 13:00 or settle for street food. For your evening meal, it’s a bit easier to find places that stay open late – coffee shops and taquerías, if nothing else – but even so, most places close for the night by 9 p.m. at the latest. On Friday and Saturday evenings: all bets are off. I mention all of this not to complain; simply to shed some light. I never really noticed these differences in operating hours in all my visits as a tourist, simply because my body kept vacation hours. I slept late most days, ate breakfast at my hostel, and didn’t have lunch until, say, 2 p.m., when everything was open. It is what it is. Hi Peter, good to hear from you! I enjoyed the fixed-price meals as a less-greasy alternative to street food…pambazos they ain’t. Thanks for commenting. wow! I mean, being chilanga I somehow knew all of that stuff, but I had never actually thought of it as a highlight of my city. It’s very interesting when you read it from a foreign point of view. 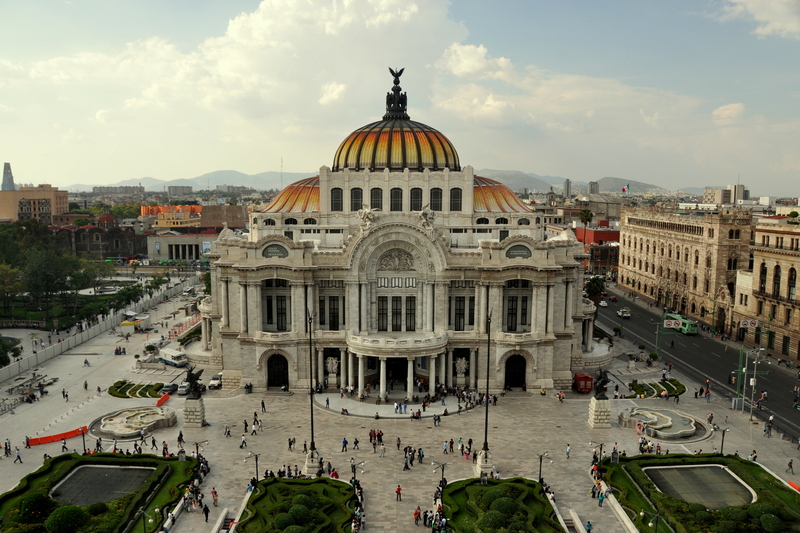 BTW I absolutely loved that view of Bellas Artes.